Billionaire entrepreneur Elon Musk set the internets aflame last week with a vague boast that he had received “verbal government approval” (whatever that means) to build the nation’s first intercity hyperloop. The 700 mph compressed-air transit system would be constructed in an underground tunnel (which hasn’t been dug yet) between New York City and Washington, D.C.
As with so many things Musk, the tweet was both widely reported and met with a fair bit of skepticism from, well, pretty much everybody. Musk, who is trying to simultaneously make things better here on Earth and send folks to Mars, is brand-new to the tunnel-digging business. His latest venture, The Boring Company, so far consists of not much more than a second-hand tunnel-boring machine and a website. This isn’t the first time Musk has spread hyperloop mania — or overestimated its feasibility. Initial plans for above-ground hyperloop systems in the Bay Area are already running about five to 10 times more pricey, per mile, than Musk’s initial estimates back in 2013, when he first proposed the idea. Assuming hyperloop costs of $100 million per mile, and tunneling costs of about the same, the 226-mile span between New York and D.C. might cost about $45 billion. And Musk wants to start digging as soon as possible — in months, not years. 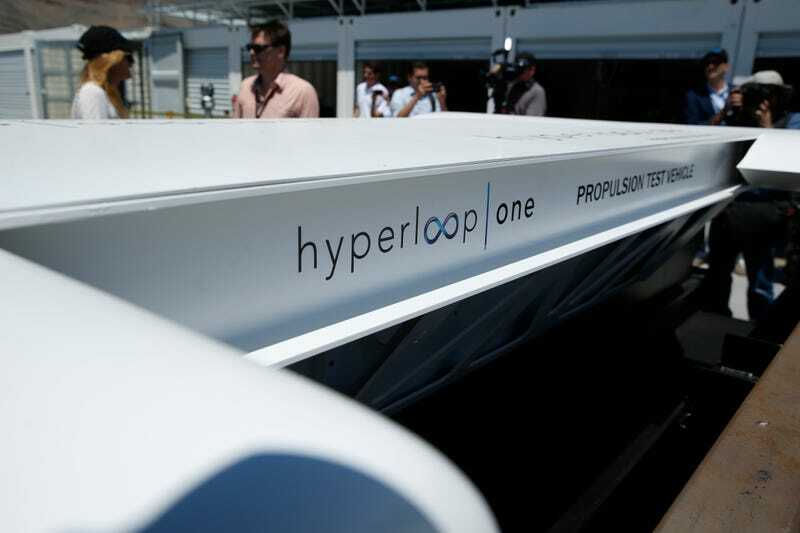 Keep in mind that no human has yet ridden in a full-scale functioning hyperloop. So, yeah. This is a really expensive, really ambitious idea. But just stick with me here. Put in proper context, the hyperloop actually represents an incredible bargain. Just the proposed transit and airport improvements needed to keep New York City functioning in the coming decades would cost more than Musk’s entire project. That includes renovations to LaGuardia Airport ($4 billion), other regional airport improvements ($6.5 billion), the rest of the Second Avenue Subway line ($17 billion), improved access at Grand Central Station ($10 billion), a new Penn Station ($1.6 billion), a revamped bus station on the city’s west side ($10 billion), and repairs to the Hudson River tunnels damaged in Hurricane Sandy ($23.9 billion). In California, construction on an eventual Bay Area to Southern California high-speed rail line approved in 2008 was initially expected to cost about $40 billion. (Its top speed would reach about 220 mph, less than one-third of the hyperloop.) A recent report found that the rail project was already about 50 percent over budget and seven years behind schedule. There’s no reason to expect a hyperloop wouldn’t run into the same sort of cost overruns. But for the sake of argument, let’s assume for a moment that a New York to D.C. hyperloop actually happens, at whatever cost: It would utterly transform the congested East Coast transit corridor. Musk said a trip between the two cities would take just 29 minutes — less time than an average subway trip from lower Manhattan to the Upper West Side. The ease of long-distance travel along the nation’s most populous corridor would revolutionize transportation as we know it. It would inspire urban planners around the world. And it could be one of the single most-important steps to reduce carbon emissions and curtail global warming in U.S. history. A functioning hyperloop would cannibalize air travel. It would also be a nearly ideal way to move cargo, greatly reducing the burden on the region’s highways and rails and providing new meaning to just-in-time shipping. Because aviation and shipping are projected to be the fastest-growing sources of new carbon emissions worldwide in the coming decades, the hyperloop — which could be operated entirely on renewable energy — is exactly the kind of technology that’s needed at exactly the right time. On its own, the East Coast hyperloop wouldn’t displace a significant fraction of global emissions. Assuming a pod leaving every minute (filled with either 20 people or a shipping container of goods), a single hyperloop line between New York and D.C. could displace half of all air traffic and half of all passenger rail traffic between those two cities, saving about 375,000 tons of carbon dioxide emissions per year. But there’s so much freight and so many people travelling along the East Coast that the region could support far more than just a single hyperloop line. More than 110 million people travel on the region’s highways (about nine hyperloops worth) and 800 million tons of freight move within the region each year (26 hyperloops worth). If even 20 percent of that huge volume were captured by a hyperloop system, its impact would be magnified tenfold. Admittedly, that’s still not a huge impact globally. In further tweets last week, Musk said the East Coast route would provide a testbed for the technology; his real goal is to revolutionize transportation worldwide. Further hyperloop systems are also imagined for California, Texas, and several other key places around the country. A system connecting the Nordic countries is in the planning phase, and a Dubai-to-Abu Dhabi route is already scheduled to be built. Hyperloop’s biggest potential, then, would come not on the U.S. East Coast, but in its ability to leapfrog air travel and truck-based logistics entirely in large parts of the burgeoning developing world, like India, China, Brazil, and East Africa. If, inspired by the success of an East Coast hyperloop, the technology catches on around the world in the next decade, 20 percent of the entire world’s intercity transportation could be served by mid-century. That, finally, would yield an enormous impact: About 1.25 billion tons of carbon dioxide emissions would be averted per year by 2050 — more than double the impact of the soon-to-be-defunct Clean Power Plan. The nerds at Wait But Why figured out that all this means the hyperloop would be the most energy-efficient form of transportation in history. (Sorry, covered wagons.) Much safer than driving. Faster than air travel. And it could cost about the same as a bus ticket. Buses. Airplanes. Those are bold transportation ideas that skeptics would have scoffed at around the same time that Edison and Westinghouse were fighting over who invented the lightbulb. Maybe we shouldn’t be too quick to dismiss something that could help remake our world, for the better.